Please read this document before installing and starting the desktop CNC plasma cutting machine. The wrong operation can cause property damage and personal injury. You must always check the system specifications and technical conditions (see device tags and related documentation). This manual only briefly introduces the operation procedure. For more details, please refer to the numerical control system specification, plasma power instruction manual, arc voltage regulator specification and capacitor adjustment instruction manual. Plasma cutting machine that are damaged or defective are not available for use. In transportation and storage, you should pay attention to moisture-proof, do not climb or stand on the product, do not place heavy objects on it, the front panel and screen should pay special attention to prevent collision and scratches. The outer shell of the CNC system is not waterproof. The installation should prevent the sun and rain. Numerical control system installation should prevent dust, corrosive gases, conductive objects, liquids and flammable intrusions. The numerical control system should be installed in places far away from flammable, explosive goods, and strong electromagnetic interference. CNC system installation must be firm, avoid vibration. The connection wire shall not be damaged, shall not be compressed, shall not open the CNC system cabinet under charge. The voltage and polarity of any wire plug must be in accordance with the specification. Keep your hands dry before inserting or flipping the switch. All wiring must be correct and firm. The numerical control system must be grounded reliably. Before running the plasma cutting machine, check whether the parameter settings are correct. The changes to the parameters must be in the range allowed by the parameter setting. Do not open the device housing and the fixed cover during the operation. Otherwise, personal injury and property damage may be caused. The main power supply should be turned off when the device is opened, otherwise, it may cause personal injury and property damage. 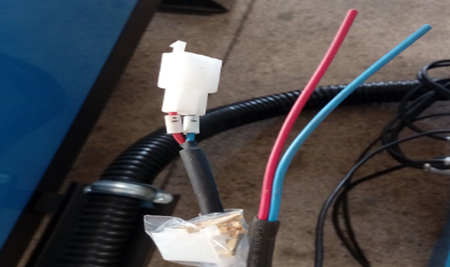 Do not plug in or pull out the connector on the plasma cutting machine when the main power is turned on, otherwise, it may cause damage and permanent damage to the plasma cutter. Wait at least 2 minutes before contacting or removing the circuit board and connector after disconnecting the main power supply. The residual charge of the capacitor in the device remains a dangerous voltage for two minutes after the main power is turned off. Disconnecting the plasma power before handling the cutting torch can lead to personal injury and property damage. When handling the cutting torch, be careful to High temperature scald caused by the cutting torch. The user must have the ability to do the job well. The operator undergoes safety training related to flame cutting and plasma cutting. With a basic knowledge of computer operation, familiar with flame cutting and plasma cutting technology. Make sure the switch is off the power before plugging in the power. The operator must not leave the equipment when the equipment is running. All wiring of the system should be confirmed before power. 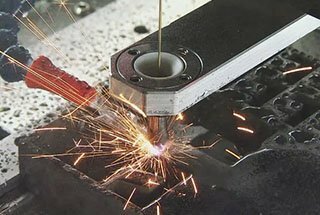 When using plasma cutting machine, the steel plate must be leveled, which can not have large fluctuations, otherwise, it will affect the cutting size accuracy and greatly reduce the service life of the nozzle and electrode. Personnel involved in troubleshooting must have corresponding professional knowledge and working ability. After an alarm has been made, the fault must be removed before restarting. This numerical control only uses 220V 50 Hz and plasma 380V 50 Hz main power supply. The customized power supply must be confirmed before place order. The environmental conditions for the use of the equipment must be identical to those specified in this manual. After unpacking the plasma cutting machine, put the plasma power in the left middle position with the mat board under it, control cabinet mounted on plasma cutting machine on the left side of the front position so that the operator can watch the whole desktop plasma cutting machine and cutting process. Remove the wire on the left side and place it parallel to the plasma cutting machine. Fix the plasma cutter with 6 anchor bolts and adjust the equipment with the balance level. Connect the power cord of the plasma power to the power supply of the workshop (three-phase 380V, 50HZ) according to the power. Connect the ground wire of the plasma power to the grid frame or steel plate. Connect the power cord of the control cabinet to the power supply of the workshop (two-phase 220V, 50HZ) and power 1.5kw. Connect the plug on the side of the control cabinet. The wire labeled V+, V- should connect with positive-negative arc pressure line of the plasma power source. Connect the inlet and outlet water pipe well and let the water in the sink reach 80mm. Connect compressed air to the inlet of the plasma power supply and adjust the air pressure to 5.0. Turn on the total power supply, control cabinet switch, main power supply, and plasma power. Operate according to the manual of plasma power supply, controller operation manual and user manual. Do not modify the set parameters in the system when you are not proficient. If the cutting quality is not good and cannot be solved, the electrode and nozzle of the plasma cutting torch shall be checked, and the damage shall be replaced. The connection cable of the main body and the electric control cabinet of the cutting machine is recommended to be laid in the way of the geosyncline, which protects the cable and easy for maintenance. 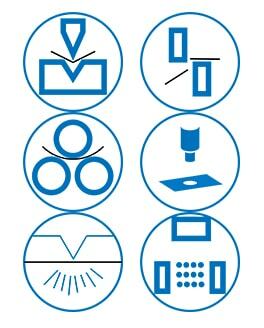 The cutting stage is marked with effective work scope, and the workpiece should be cut within the scope of the marking. Control system total power supply cable, power 1.5 KW, voltage: 2 phase 220V. The length of the cable from the side of the plasma cutting machine is about 4.5 m, the total power supply cable of the control system is 2 phase cable, the wire diameter is 1.5 mm2, the power supply cable of the plasma power is 4 core, and the line diameter is 6mm2. The two cables and air pipes slide through the air towing frame, and then go down to the main switchboard of the power supply unit along the plant wall and then connect them to different switches and lower ends. The control system and the plasma power supply must be reliably grounded. In order to avoid the large power fluctuation (> ±10%) and the possible instant signals interference, the CNC plasma cutter should use special line of power supply equipment (such as from the low voltage transformer room points along the way for the use of numerical control equipment alone) or additional voltage stabilizer, can reduce the influence of the quality of power supply and electrical interference. If there is a lot of electric welding machine, argon arc welding machine, plasma cutting machine, high-frequency interference sources such as high-power inverter in the workplace, please adding the filter on the power supply cable for the numerical control system to shield interference. A sudden power cut leads to the loss of the cutting file and the production of waste. Frequent sudden power outages can cause damage to CNC software or even hardware. Therefore, in the case of frequent blackouts, a 500W UPS power supply should be considered for NC system. Air compressor (compressor flow 1m3/ min), the output air pressure of the compressor should be between 6.1-8.2Bar when the plasma power is used for cutting. When air pressure is lower than 5.5 Bar, the cutting quality will be seriously affected. The pressure below 4Bar, the plasma power will damage the electrode and disable the plasma cutting machine. The air pipe adopts high-pressure rubber tube with the inner diameter of φ10mm, pressure 2Mpa (20 Bar). A powerful ventilation device must be installed in the workplace to remove the smoke from the cutting process. Before the plasma cutting equipment is energized, all the switches on the machine should be checked to be closed. The rotating switch at the rear of the plasma power is in a horizontal position. Switch on the power of the main switching-off cabinet to make the two cables have electricity. Close the circuit breaker in the equipment cabinet to the ON location. Switch on the system control power supply, the display should have the main interface. Then the rotary switch at the back of the plasma power rotate 90 ° to the vertical position, the power indicator should be on the front of the plasma power supply. Open air compressor (compressor flow 1m3/ min), adjust the air compressor pressure control switch to make the compressor output pressure 6.1-8.2Bar. The air pressure is lower than 6.1 Bar, the pressure will decrease when cutting, thus the cutting quality is unstable. Air pressure is higher than 8.3 Bar, which can cause air filter damage on the plasma power supply. 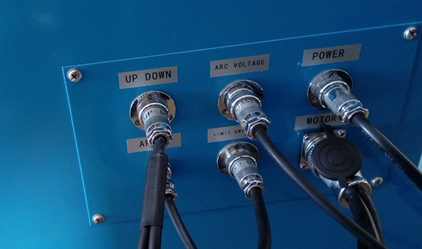 Adjust the pressure control knob on the plasma power supply to keep the pressure at 5.5-6.0 Bar. Rotate the plasma power current adjustment/gas test knob to the gas test position to confirm that the pressure will not decrease to below 5Bar. When the pressure is lower than 5Bar, the cutting quality will be seriously affected and even the plasma power will stop working. If the working environment is not guaranteed to be clean, the multi-level joint filtration system should be installed in front of the plasma power supply. Otherwise, the air containing oil, moisture and dust will cause the serious consequences of arc failure and destruction of the cutting torch. If plasma cutting is used, the boot preparation is completed. The cutting mode of nc system is set to plasma mode, and open the power of arc voltage regulator. The parameters of arc pressure adjustment are only set with arc pressure value, perforation time, and other parameters of positioning time are set by the CNC system. Please refer to the manual of arc pressure. Use professional drawing software (such as AUTOCAD) to draw cutting graphics, and then use programming software to edit programs. Use the system-provided library to edit. Please refer to the manual of the nc system. Use the system-provided metal plate nesting function. After the cutting program has been transferred into the memory, it returns to the main interface to observe whether the graphics display area is in line with the requirements. Please refer to the numerical control system and the manual of the arc pressure regulator. Below is the manual of one China’s controller’s manual, you can click to download it. If there are different, please refer to the latest numerical control system manual. In the process of plasma cutting, the operator should wear a hat and safety goggles and buckle up. Automatic alignment of steel plates: that is, the function of measuring the angle of rotation. Normally, when the operator is hoisting the steel plate on the platform, it is not easy to parallel the steel plate to the Y-axis of the plasma cutter. This function can measure the rotation angle of the steel plate and automatically rotate the cutting graph to the same angle to reduce the cutting residual material and improve the utilization rate. After finish editing the cutting graphics, manually move the plasma cutting machine to the upper left corner of steel plate, under the main interface, press “F2” button of file, then press the “F7” button which used for measure rotation angle, use the direction key to move plasma cutting machine to the lower left corner of the steel plate, press “F1” to confirm, return to the interface of “options” parts. The graphics preview area on the left shows the cutting graphic of angle rotation. Press the RUN key and enter the cutting interface. Once again, confirm that the cutting pattern meets the requirements and press the RUN button again to start cutting automatically. Note: before cutting, please manually lift the torch to the center and the upper position. During the cutting process, pay attention to the running state of the plasma cutting machine. In case of failure, you can manually adjust the cutting torch, then press the STOP button to enter the pause interface. The malfunction can be eliminated by the functions of “point moving forward”, “electric backward”, “return of the original point”, “return to starting point”, “handling cutting torch” and “breakpoint memory”. After troubleshooting, press the RUN button twice and start cutting again. It can also be used to manually turn off the automatic height adjustment function when it is running to the corner of the steel plate. At this point, you should pay close attention to the position of the cutting torch, and manually adjust the cutting height in time. under the pause interface, press “back to original point” to enable the CNC plasma cutting machine to return along the cutting path. When the machine returns to the point of failure, press the “stop” button and stop returning. In conjunction with the “jog moving forward” and “jog moving backward”, you can accurately locate the appropriate position, reignite, preheat and start cutting. press this key each time to make the plasma cutting machine move forward along the cutting path (backward). This distance is determined by the parameter setting the value of “jog movement distance” in the “universal parameter” parameter interface. under the interface, press “handle cutting torch” can move cutting torch outside steel plate, replace, handle cutting torch mouth. Press the “return” key to move the plasma cutter machine to the interrupt location and continue cutting. Note: when replacing the cutting nozzle, handling the cutting distance, the plasma power should be cut off, and the plasma power will be switched on after the handling is finished. Otherwise, the plasma power will have an error alarm. Pay attention to the cutting torch. The temperature is very high when it is just stopped cutting. under the pause interface, press “F6” (breakpoint memory) key, the system will save the unperformed part of the program. After you return to the main interface, you can do something else, then press the file “F2” to enter the “file” interface. According to the memory file “F5”, press the breakpoint memory “F2” to transfer the remaining cut graphics into memory. Return to the main interface and continue cutting. The plasma cutting machine cannot be moved in this process. If you want to give up the cut, press the STOP button again, press the “F7” key to confirm, and return to the main interface. After cutting, return to the main interface. When completing the cutting process, close the air compressor. Enter the joggle state, move the cutting device to the left, the machine moves to the parking position, and turn off the power of the controller. After five minutes, turn off the plasma power and turn off the control system power. 1. It is necessary to check the leakage phenomenon of the air circuit system, plasma power supply and cutting torch before work. Once found, it must be eliminated. 2. Before cutting, it is necessary to check whether the cutting nozzle and electrode are in accordance with the plasma power current setting and steel plate thickness. The current strength shall be within 95% of the working current of the nozzle. For example, the current strength of the nozzle of 100A should be set at 95A. 3. Check whether the gas pressure is within the allowable range. If the gas is clean, check the air compressor regularly. Check the air filter regularly and replace the accessories in time. 4. When replacing the cutting part or the plasma cutting machine is not in use for a long time, turn the current adjusting knob to the gas test position or manually open the solenoid valve, eliminate the water vapor and impurities in gas path and the torch. 5. The guide surface of the longitudinal guide and horizontal guide rail must be cleaned and coated with oil after use. 6. The operator should shut off the power source and the gas source when resting or leaving the machine for a long time. 7. After the CNC cutting machine finished using, must wait for a period of time when the appliance cabinet and plasma power supply are fully cooled, then turned off the power supply. 8. Always check and use the brush to clean the rack and grease. 9. Regularly lubricate the lifting mechanism (ball bearing, screw, linear guide slider). Add lubricating oil to the X-axis linear guide slider. 10. Regularly clean off the cutting slag under the cutting table and wipe off the dust on the surface of the plasma cutting equipment. 11. Regularly check whether the upper and lower limit switches are in good condition and replace the failed switch in time. 12. Clean the grey layer on the side of the rack with a dry brush every month. Open the electric cabinet every three months and clean the grey layer inside the cabinet. 13. Check whether the servo motor’s elastic clamping mechanism is reliable every three months and adjust the spring pressure bolts to make the pressure fit. 14. Check presence of wear and tear of the cables on plasma cutter every three months. 15. Check the tight bolts lose or not every year. 16. Check the direct current motor brush every year, and the excessive wear of the DC motor will affect the performance of the motor and even damage the motor. Therefore, the motor brush should be inspected and replaced regularly. 17. In the absence of the processing tasks, the plasma cutting machine should connect the electricity regularly, it is best to electrify 1-2 times a week, every time start an empty running for about 1 hour, to take advantage of heat generated by the machine itself to reduce the humidity inside the plasma cutter machine, make the electronic components shall not be affected with damp. 18. In order to avoid big the power fluctuation (>±10%) and the possible instant interference signals, the plasma cutter equipment adopts special line of power supply (such as from low voltage transformer room all the way for the use of numerical control equipment alone) or additional voltage stabilizer, can reduce the influence of the quality of power supply and electrical interference. 19. Check whether the terminals are fastened every year. The terminal may be loose due to long-running and vibration, and the loose terminal will be damaged due to heat. Plasma cutting machine is a new type of hot cutting equipment, its working principle is based on the compressed air as working gas, high temperature and high speed of plasma arc as heat source, molten metal will be partially melted, and at the same time high-speed air blow away the molten metal, and form the narrow cut seam. Plasma cutting can be used for stainless steel, aluminum, copper, cast iron, carbon steel and other metal material cutting, are featured quick cutting speed, narrow cutting seam width, smooth cutting surface, small heat affected zone, small deformation of the workpiece and simple operation, and has remarkable energy-saving effect. The plasma cutting equipment is suitable for the manufacturing, installation and maintenance of all kinds of machine and do various cutting fabrication such as medium plate cut off, trepanning, chamfering etc. 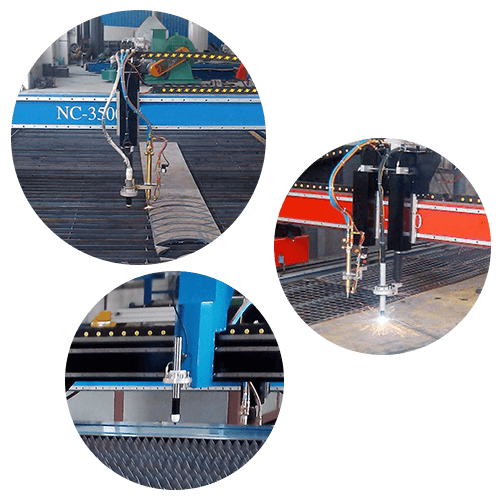 Various plasma arc cutting process parameters directly affect the stability, cutting quality and effect of the cutting process. Increasing the cutting current can also increase the power of the plasma arc, but it is limited by the maximum allowable current, otherwise, the plasma arc column will be thicker, the width of the slit will increase and the electrode life will decrease. The parts of the cutting torch must be corresponding to the plasma power current setting. For example, the current strength of the nozzle of 100A should be set to within 95A. 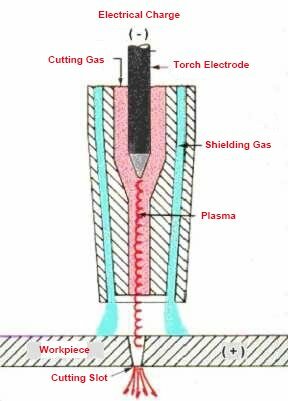 Increasing the gas flow can increase the arc column voltage and increase the compression of the arc column so that the plasma arc energy is more concentrated and the jet force is stronger, thus the cutting speed and quality can be improved. However, if the gas flow is too large, it will shorten the arc column and increase the loss of heat and reduce the cutting ability until the cutting process cannot be carried out normally. Cutting height is the distance from the end of the cutting nozzle to the surface of the cut piece. The distance is usually 2-5mm. Only suitable height of the cutting mouth can ensure the cutting efficiency of the plasma arc. Otherwise, cutting efficiency and cutting quality will be reduced and even the cutting nozzle will be burned. The cutting nozzle height can refer to the plasma power supply specification or adjust according to the cutting experience. In perforation, the height of the cutting nozzle should be adjusted to twice the height of the cutting nozzle during normal cutting. 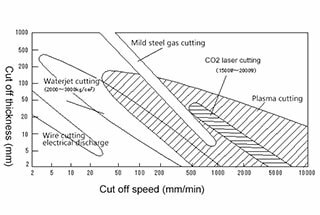 The above various factors directly affect the compression effect of the plasma arc, also have an influence on plasma arc temperature and energy density, and plasma arc of high temperature and high energy determines the cutting speed, so the above various factors are related to the cutting speed. As long as the cutting quality is guaranteed, the cutting speed should be improved as far as possible. This not only increases the productivity but also reduces the deformation of the cut part and the thermal influence region of the cutting slot. If the cutting speed is not suitable, the effect is the opposite, and it will increase the viscosity and reduce the quality of the cutting. The thickness of steel plate has a great influence on the selection of cutting process, even for the same cutting torch, its perforation capacity (thickness) is only half of the cutting ability (thickness). For example, the cutting capacity of Hypertherm 100A plasma power is recommended to be 16mm, and the perforation capacity is 12mm. Therefore, when the thickness of the steel plate is greater than the perforation capacity, the cutting should not be perforated directly in the middle of the steel plate, and the cutting start point should be set at the edge of the steel plate and cutting from the edge. The steel plate passes through a series of process to the cutting workshop, and during this time, the surface of the steel plate inevitably produces an oxide coating. In addition, the steel plate also produces a layer of the oxide coating on the surface of the steel plate during rolling. The melting point of these oxide skins is high and not easy to melt, which reduced the cutting speed. Meanwhile, after heating, the oxidized skin spatters, which can cause blockage of the cutting nozzle and reduce the nozzle and electrode life of the cutting nozzle. Therefore, it is necessary to remove rust pretreatment before cutting. The usual method is to remove the rust and then spray the conductive paint to prevent rust. That is spraying the small iron sand onto the surface of the steel plate, and remove the oxidized layer by the punching force generated by the iron sand, then spray anti-rust paint with the flame retardant and good conductivity. Pretreatment of de-rusting and paint spray before steel plate cutting has become an indispensable process in metal structure production. 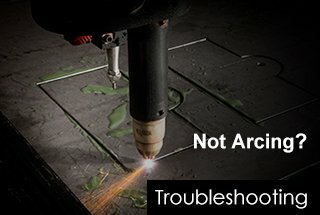 Problem is my plasma cutting machine start then disconnected my cnc controller please suggest me .